What did you have for breakfast this morning? Toast, cereal, juice, and fruit? Thank the honey bees! About one out of every three mouthfuls we eat is affected by honey bee pollination. In Explore Honey Bees! 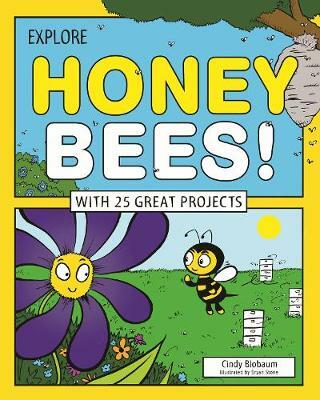 With 25 Great Projects, young readers learn about honey bee colonies, why honey bees live in hives, how honey bees communicate with each other, and why they are so important to human lives. Colony collapse disorder first appeared in 2006 and since then beekeepers have seen disappearances of 30 to 90 percent of their bee colonies each year. Readers learn about possible reasons behind and solutions to this growing global problem. Explore Honey Bees! offers a glimpse into a miniature world familiar to children. Activities include designing a hive and making a model of a flower's reproductive system, reinforcing the math and science skills readers gain from the text. Fun facts and colorful illustrations make learning fun and exciting. Links to online primary sources integrate a digital learning experience and offer opportunities to delve deeper into the world of honey bees. This title meets Common Core State Standards in language arts, science and technology; Guided Reading Levels and Lexile measurements indicate grade level and text complexity.